Shaving Brush. Beech hardwood handle with synthetic, extra soft nylon bristle knot. Handle colouring will vary in darkness and grain being a natural product. Beautiful shave brush - lathe turned from Beech hardwood - hand finished with lacquer and soft nylon bristles for many years use. The bristles are as soft as badger hair and last longer. 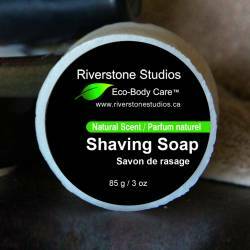 In fact - 10 out of 10 badgers prefer you use Riverstone Naturals Shave Brush over natural hair brushes. The knot produces an excellent lather when used with our moisturizing Shave Soap containing Jojoba, Coconut Oil, Castor Seed Oil and Bentonite Clay containing 70 trace minerals to leave your skin with a close shave you'll love. Wood colour will vary being a natural product.